Psoriasis occurs in a small percentage of the general population. It is a chronic skin condition characterized by scaly red patches of skin, which are usually itchy. Stress and changes in weather/temperature are said to cause skin flare ups. There is no found cure yet for psoriasis but there are natural ways to keep it at bay. 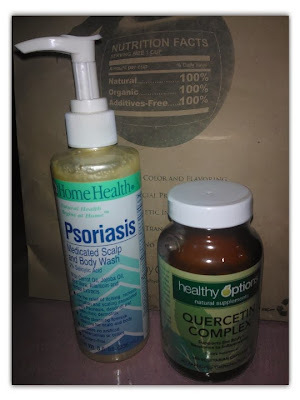 Home Health's Psoriasis Medicated Scalp and Body Wash have good reviews from those who have used it. The medication consists of 2% Salicylic Acid, a topical agent known to work with common skin problems, mixed with Carrot Oil, Jojoba Oil, Aloe Vera, Allantoin and herbal extracts. Psoriasis Medicated Scalp and Body Wash is available at Healthy Options outlets and online at iHerb and Amazon. The -ber months and the first few two months of the year bring cool winds and lower temperatures that may lead to seasonal allergies with symptoms that include sneezing, wheezing, runny nose, and watery and itchy eyes. One naturopathic cure for allergies is Quercetin Complex. Quercetin is a naturally occurring plant pigmentation that gives fruits, vegetables and flowers their color. It acts as an anti-histamine and an anti-oxidant, as well as assists in anti-inflammatory activities. There are studies that indicate Quercetin's healing properties for heart diseases and cancer. Suggested use is one to six capsules daily, taken between meals. So far, Quercetin has been effective in curing my seasonal morning sneezing and runny nose. I take two (2) capsules in the morning after breakfast. Quercetin Complex is also available in Healthy Options.